Building a Better Business Using the LEGO® SERIOUS PLAY® Method delivers a creative approach to enhancing innovation and improving business performance, with the focus on unleashing play. Written by the two original Master Trainers for LEGO SERIOUS PLAY (LSP), the book outlines how LSP can develop teams, people, relationships and business . Based on the merging of play with organizational development, systems thinking and strategy development, LSP can foster improved meetings, faster innovation processes, team growth, and better communication. The LEGO SERIOUS PLAY method is employed by start-ups and multinational corporations alike to maximize synergy among teams and throughout organizations. 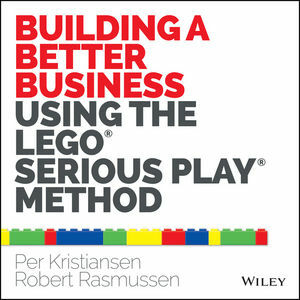 For leaders looking to boost effectiveness and see better results, Building a Better Business Using the LEGO® SERIOUS PLAY® Method is a comprehensive introduction to this creative management technique. Per Kristiansen is owner and partner at Trivium. Previously, Per was the global head for the LEGO SERIOUS PLAY business unit in LEGO. He is a master trainer of the LEGO SERIOUS PLAY methodology, and also serves on the board of Bonding, a global training company. Robert Rasmussen is co-principal for Rasmussen Consulting in the United States and in Denmark and is on the advisory board for Rasmussen Consulting in Japan and Singapore. Robert is the main architect and a master trainer of the LEGO SERIOUS PLAY methodology.